Leslie Jones, inspired by Melissa McCarthy’s role as Sean Spicer on “SNL,” decided that she wanted to take on the role of Donald Trump. 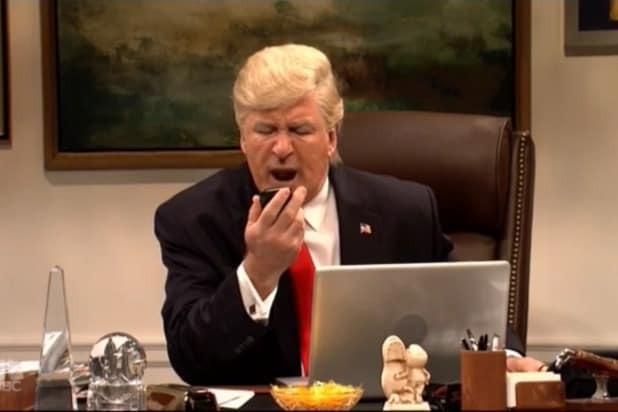 Jones insisted on dressing up in the Trump costume and makeup, finding herself obsessed with the role. “Do you really think he is going to do this the next four years?” Jones asked in the behind-the-scenes documentary style sketch. “Doesn’t he have other stuff to do? I’m not sure. but who is going to replace him? “SNL” then cut to a personal moment between Jones and Kyle Mooney, referencing a sketch earlier this season where the two were in a relationship. Other cast members questioned Jones on her decision to play Trump, asking if her decision was a comment on race in politics. “Nope, it is about giving America what it wants,” she answered. Jones then took her idea to “SNL” creator and executive producer Lorne Michaels. “And then, the moment of truth,” she narrated. “It is not going to happen, Leslie,” he told her.